So when I found out he was coming down for a few days, I couldn’t wait to begin a new tradition of sharing healthy family habits and sharing a little of what I’ve learned. We walked. To my sister’s house. To a friends house. Just a few blocks here and there. We played. With the nephews. Chasing balls. Throwing balls. Helping them on the fireman’s pole. We shopped. We read labels. He asked questions. I tried to answer. We ate. Healthy foods with fabulous flavor. Fresh summer squash with pesto. Berries and plain greek yogurt. Healthy chicken salad. Baked lentil chips. By the end of the weekend, he discovered several new foods and great snack options. He wore his sneakers more than his loafers. He knows the difference between a protein and a carb. He’s going home with bags of herbs, healthy snacks, brown rice pasta, and amazing cereals. And he happily reported that he felt better after getting outside and walking a bit! And me? Well, I’m feeling pretty grateful. Have you changed old or created new family health habits? Love this! My mom is uber-healthy. She eats well, most of the time. And works out. Great role model. So’s my mom – but she didn’t really start that til I was gone – so my sis learned all of that – ha! I LOVE this! so happy you had such an awesome visit with your Dad! growing up my mom cooked healthy, carob instead of chocolate and all that… my mom played tennis and that’s where I got my tennis love from, but other than that my family (and later step family additions) were never really active – I pursued those interests myself. yes – spinach or cashews are my “foundations” 🙂 I’m excited because my dad sometimes reads my blog, and he is OPEN to it – we are having fun! yep, just another Twin Thang. 😉 my best to your dad – and you! What a great weekend! 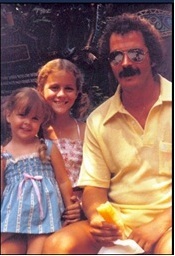 I love the picture too – I think my dad had a similar mustache back in the day! My son has officially rebelled against all things healthy – except he’s hooked on smoothies made with frozen fruit and yogurt. Gotta love the 70’s stache… those were the days 😀 I’m glad your boy is drinking smoothies – mine is a carboholic – that was actually cool when he left cuz I dumped the cupboards LOL Rumor has it he’s eating better – hmmmmm – sooo curious!